Unlike other parts on an aircraft the leather was at fact at one point, alive! So naturally it will deteriorate without proper care. Here are a few steps to cleaning and conditioning aircraft leather in order to keep it at a high quality. 1. Buy a quality leather conditioner and cleaner.You will want cleaner and conditioner that protects against harmful UV rays. The leather on your seat is often under constant attack from UV rays that can damage the leather if left untreated for too long. UV rays are what give you sunburn, and essentially the same thing happens to your leather seat while you are flying. Prolonged UV damage will result in cracking and fading. Remember that leather was once a living thing, so protecting it from sun damage is very important to keep its integrity secure. You will need a conditioner that essentially acts as sunscreen for your leather. This is crucial to preserving a quality leather seat and interior, and preventing the leather from losing value quickly and easily. We recommend Perrone Aircraft Cleaner and Conditioner. 2. Clean spills quickly. Do not let your leather become wet for any extended period of time. The water will seep into leather slowly and sit on the surface, which will lead to damage if left for too long. Prevent water damage such as swelling and fading by promptly drying the surface of aircraft leather so that no water can compromise its structure in any way. 3. Get yourself a sturdy brush to grind out tough stains. A good brush can be hard to find, but in order to effectively scrub out deeply ingrained stains in the pores of aircraft leather, you will need a brush that has strong enough fibers to dig deep into the contours of leather. A brush with a strong handle is preferred as well. For example, a brush with a wooden back is easy to handle and used to scrub into the root of the stain in your leather. 4. Get the right cleaning agent for what you need. If your leather seat has ink blotches, you will need a different cleaner to quickly and effectively clean your seat than if you had the beginnings of simple wear and tear. A conditioner may be used to combat further normal sun damage, but it will not necessarily get rid of that ink stain. There are many cleaning products made especially for the purpose of removing ink from leather. Know specifically what you typically clean off of your leather, and find the appropriate product aimed at solving your unique problem. Perrone also makes a great ink stain remover. Just be sure to get to the stain quickly before it sinks deeper into the top-coat. 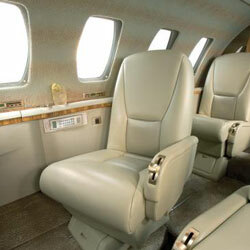 By using these simple tips, your aircraft leather seat will look as good as new and will resist future damage. Proper regular care is the main important tip for any aircraft detailing procedure. Keeping your aircraft leather in good condition only requires a few moments of diligence every day. With these tips, your leather will shine for a long time. 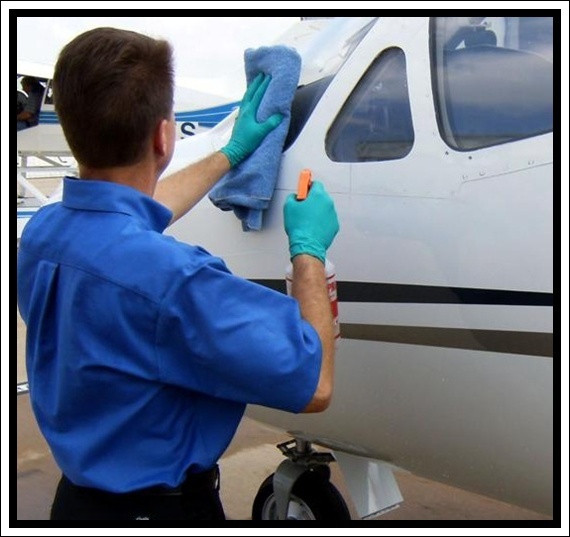 Dry Washing aircraft refers to the cleaning of easily noticeable bugs, carbon stains, oil stains etc. off of the exterior. All blemishes should be removed with relative ease by hand by using our cleaners and clean terry towels. This service will also include wiping down the windshield with Plexi-clear to free it of bugsv etc. a.) Select a Panel: Look for bugs, dirt, grease, exhaust stains, and any other blemishes that can be easily removed from the surface of aircraft. Be sure to look at belly as this is where most grease and buildup happens. *It’s best to start cleaning at the nose of aircraft and work your way backwards down the fuselage. Polish the wings after you finish the fuselage. You may need to stand on the inner-wing to polish areas on top of the fuselage. b.) Spray and Clean: Hold Powerfoam 8 inches from surface and spray until foam covers the affected area. Then Take clean terry towel cloth and rub into Powerfoam with fingers to agitate the bugs, grease, dirt, etc off the dirty paint. Once area is cleaned, wipe surface with a clean terry towel to remove streaks etc..
c.) Check and Continue: Check over your now clean paint and check for streaks, more bugs etc. then continue to next area of affected paint. Continue this process over every affected area of the exterior. a.) Clean Windows/Windshield: Wipe off windshield & windows by spraying them down with Plexi-clear. Completely cover the area of windshield that you’re cleaning. Once covered, take a clean terry towel cloth and swipe the surface clean. Once Plexi-clear is fully cleared off the surface, take a clean micro-fiber and wipe surface down to remove streaks etc. Be sure to look at work once finished to make sure there’s no streaks, especially on the windshield. Wipe Bright Work Clean (if not polishing): The same procedure can be used to clean bugs off the bright work: Spray them with Plexi-clear and wipe clean and dry with a terry towel. a.) Remove Tape: Remove ALL Tape from Static Ports and Edges of Paint that you were working on. b.) Check work AGAIN: Check over work for streaks, missed areas, etc. c.) Clean Up: Put dirty rags in correct bins, throw away trash & gloves etc. Step 2: Spray Earth Soap mixture onto scrubbing sponge and start to scrub and agitate the grease off of belly one section at a time. Step 3: Once grease begins to come up, wipe clean with terry or micro fiber towel. Step 4: Repeat this process over the tough grease areas.